Suggestions on how to "learn" with two Nikon TTL flashes? I'm in the process of moving from Phottix Strato II to Cactus V6, and have three V6 units so far. As budget allows, I'll pick up the remaining three that I need to fully replace the Strato II units. My primary use for wireless slaves is shooting amateur roller derby, so this is a hobby rather than an income. So far the V6 is working well with my SB-600, but I'm not sure what I should do with the other three stations I have set up in the rink. The other three are a mix of old Nikon TTL flashes, including SB-24, SB-25, SB-26, and SB-28DX. Each of these three stations has two flashes. One flash sits on the wireless slave, and the other flash currently connects to the wireless slave via an 1/8" to PC cable. I'm thinking I need to train the three V6 about the power output of the two attached flashes (each station will always have the same configuration, so I don't have to worry about mixing them up), but I'm not sure if it will work properly? Will a configuration of SB-24 on the V6 and SB-24 with PC cable connected to the V6's 1/8" socket train properly (hopefully this is the case) at 1m from a white surface? Or do I need to replace my PC cables with Nikon SC-19 TTL sync cords (at least they're not that expensive used through eBay)? Or will this not work at all (but I can't see why it wouldn't work)? In order for the V6 to control the flash power ouput of a remote (slave) flash, the flash unit must be hot shoe mounted. A PC sync cable can only transmit a basic flash triggering signal, there's no other information being transmtted, so each flash unit has to be mounted on a V6 transceiver's hot shoe and with the corresponding flash profile. If a particular flash model is not listed, you may try to learn it's flash profile by using the Learning Program built-in on each V6. Be sure to install the latest firmware version as I believe the latest one has improved the learning program - giving more time for the flash to recharge after each cycle. In any case, do put in fresh (charged) set of batteries before the learning the flash. Ok, thanks. I have the latest firmware and Quantum battery packs, so I'm good on that. I have a half-dozen SB-24/25/26/28DX flashes in three groups of two each. I do hear what you're saying about the PC cable not being usable in this context, so what I'll do is pick up a few Nikon TTL flash sync cables. The Nikon SC-26 cable, for example, is a 5ft cable which does support legacy TTL (not i-TTL or D-TTL) and connects two SB-2x flashes together, and "teach" the V6 for that particular configuration of the two attached TTL flashes. Cool! Do let us know how you get on with your dual-speedlight setup. I haven't tried it so it would be interesting to see how such a setup works on the V6. So, I have an update. I went through the training cycle with a pair of Speedlights consisting of an SB-25 and SB-26, which have the same GN of 36, with a combined GN of 51, and then cloned that configuration to my other two pairs. The 24/25/26/28DX all have a GN of 36, so cloning the configuration was the easiest way to training the rest. The only negative I see so far is the V6s reconfiguring themselves a lot. I have a D3s with 80-200/2.8 on my left, and a D600 with 18-35/3.3-4.5 on my right, both with a V6 TX. There was the ability to lock out the dial, but other settings "randomly" changed during the bout as one body or the other would bump against me. It's also _very_ easy to bump the "fire" button on the V6, but that's not as big a deal. I might have to make up a plastic hinged cover of some sort for the menu/OK buttons on the V6. I did, however, run into significant problems with my V6 that had an SB-600 attached, and I don't know what I should do about it. I know the SB-600 is an intelligent flash and power-on sequence matters, but it didn't matter if I turned on the SB-600 first or the V6, the SB-600 would eventually no longer accept power output changes. I ended up switching to "manual flash" and setting the SB-600 to 1/16th. When using the SB-600 profile in the V6, how should the SB-600 be configured? Good to hear you've successfully learned and cloned your NIkon flash units. With your "V6 reconfiguring themselves" issue, firstly please note that the V6 was not designed for such a dual-camera setup. In our own tests the V6 RX units often go ballistics after a few shots, because they don't know which TX to listen to and the signal from the TX units might jam each other. This would be like 2 CEOs in a company staff don't know who has the final say. In my own tests, I was able to fire more consistently (and unchanged power levels) if my second camera had a V5, which is a basic trigger with no power controls. All compatible flash models, including the ones you learnred and cloned, should always stay in TTL mode. That's the only mode that the V6 is able to adjust its power output. Manual power control from the V6: All the above steps except enabling TTL pass through, and you can control SB-600 from the V6 TX unit but press and hold the MENU button and then roate the Adjustment Dial. This is easier to do if your camera is on a tripod. Manual power control directly on the flash unit: Set to M mode on the SB-600 and adjust the power manually on the flash. Thanks for the reply. I played around with the two TX units for a bit before the bout started, and figured out pretty quickly that the TX units don't know about each other, and the RX units simply listen to whoever transmitted the most recent configuration message. So what I did was to make all changes from my "primary" TX, even if I was about to shoot with my "secondary", and I had my secondary TX set to 1/128th the whole time as a reminder. In fact, if I suspected that something wasn't right, I would turn off the primary TX and turn it back on again, causing a reconfigure transmission to the RX units. The problem I was running into with the TX units reconfiguring themselves was because the buttons kept getting bumped as one body or the other was bumping into me. I would often see my flashes fire, even though I wasn't shooting, so I'd adjust how the other body was turned, so the "fire" button wasn't being pressed. This isn't something you can really do much about, though, except maybe to have a "lock all buttons" mode where no button presses would do anything without first pressing and holding, I dunno, the "fire" and "menu" buttons for two seconds. Regarding the SB-600, it was on a stand at station #4, configured as RX with group D. The SB-600 would eventually just stop reconfiguring, and would get stuck at like 1/16th power, no matter what I adjusted the power output to on the TX. I don't know if there's something wrong with the SB-600, or if it needs to be "defaulted" or something. Should it just work? If I follow the correct power-on sequence, and configure the V6 (with the latest firmware) to the SB-600 profile, should the SB-600 "just work"? Hi Chirs, in case you didn't know we do have a DIAL LOCK function which prevent accidental bumping the Adjustment Dial. Simply long press the OK button and the dial is locked. You can long press again to unlock it or there's an option to temporary unlocking it (approx 2 secs) by pressing the OK button once. Again, we don't recommend having more than one V6 TX in the same setup as it was not designed for this. But if you absolutely need two transmitter and you want to avoid signal jamming or RX units going crazy, you may consider getting a pair of Cactus V5 as the transmitter. The SB-600 should indeed just work. When you adjust the power from the TX, do you also see the power values changing on the RX's LCD? If it matches the values on your TX but the SB-600 is not, then it's likely a hot shoe connection issue. From memory, SB-600 hot shoes has a loose fit on the V6 female hot shoe. So do make sure the hot shoe is securely mounted. If the flash wobbles quite a bit then you may cut out small pieces of masking tape so it clamps in place and less chance where the contact pins not lined up. Whichever body was hanging at my side was causing button-presses, because the V6 on top of the body has a fairly large footprint. I can probably work around it, though, by making up hinged plastic shields for the buttons. As a software engineer, I do understand where you're coming from about not supporting multiple V6 TX units. I don't fire the V6 TX units simultaneously, and figure out before the bout started that only one TX unit could do the configuring. The way I see it, as long as you don't have two TX units both attempting to configure (well, except for the random button-presses), but they're all on the same channel, I should be ok. I can't go with a V5, partly because I already have all V6, and partly because I need four groups depending on where I am aiming whichever body I am shooting with at that moment. And yeah, the SB-600 hot shoe is probably related. It did feel wobbly. The RX unit seemed to reflect what the TX commanded, but the SB-600 would behave randomly. I'll try placing some tape on the top surface of the SB-600's hot shoe to see if that improves. ... I can't go with a V5, partly because I already have all V6, and partly because I need four groups depending on where I am aiming whichever body I am shooting with at that moment. Mount V5 transceivers on the cameras: it serves as triggering a flash signal. Set one V6 to TX mode in your hand - probably more sensible around your neck using the lanyard loop, to do all the remote controls. I think this will minimize accidental presses of the Menu and OK buttons when the V6 is hanging down from your neck and the buttons faces up. And it should be an easier option compared to making a hinged plastic shield? FYI this was the method I have personally tested and that did not caused RX to go crazy / not repsonding. You do have a valid point, and in fact, I am planning on giving that sort of configuration a try with the "HyperSync / HSS" trick that was posted on another page. I haven't started experimenting with it yet to figure out how many milliseconds I need to delay to get proper sync at high speed, but I have a spare V6, so I'll find out soon. Oh, one last thing, I've been meaning to ask, is there a pinout anywhere for the Cactus V6 accessory cables? I already have a set of Phottix cables with 2.5mm connectors for all of my Nikon bodies, and I'd like to figure out if I can pick up 2.5mm to 3.5mm adapters so I can use the Phottix with the Cactus. Yes do give the V5 + V6 combo setup a try. So were you shooting that sequence all on one camera? 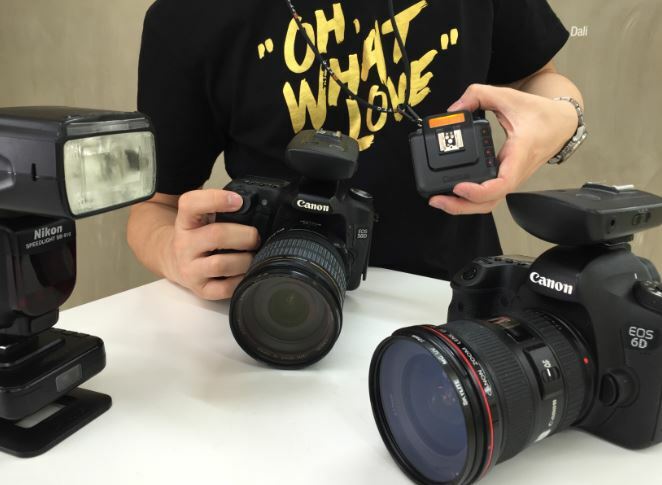 Since you need to hand held the camera and compose why would you want to release both camera shutters from one V6 unit? If you have the cameras on tripods, you can certainly do that by using V6's Relay Mode. Now you can see why the Cactus TX units can end up being reconfigured on their own. The Cactus RX units are scattered around the roller derby track, so you can't see them in this shot. And what you see here is why it would be difficult to have V5's on the bodies and a hand-held V6 to trigger. I don't have a third hand to press the trigger on a V6. I do have an update on the SB-600, by the way. I narrowed it down to the Quantum Battery 1+ cable I was using. Go figure. I was playing around with making up plastic shims, and the problem was still happening. So I moved the Quantum cable and V6 from the SB-600 to my SB-700, and the same problems happened. I dug up another Quantum cable, and all of the problems seem to have gone away. I guess there's something loose in the first Quantum cable that was maybe causing the flash to crash. So thanks for the suggestion on the shims, but it looks like, for the moment, my SB-600 problems are gone. Good to hear you have singled out the issue previously on the SB-600! See below picture of a quick sample setup. I hope this clears any confusion with what I described earlier. Ok, sorry, I guess I'm not completely sure of which device performs what function. In this configuration, what units are TX, and what units are RX? Only the V6 with the flash sitting on is in RX mode. Note that V5 only sends out a basic trigger signal so it won't send out any power / group info, and thus a much lower chance of driving the RX unit(s) crazy. Ok, that's what I was imagining. I only shoot with one body at a time, and I can't hold a D3s with 80-200/2.8 with one hand (while trying to brace a heavy body and lens, zooming and composing) and a trigger with the other hand. No, actually, after shooting a second roller derby bout, I'm starting to get the hang of shooting with two V6's in TX. I still had the occasional problem with the D600's V6 (secondary) being reconfigured, but I'm going to make something up to cover the buttons on the secondary V6. I turn it on, configure it for A through D at 1/128th, and then turn on the primary V6 and do all of the proper configuration from there. As long as the secondary V6 doesn't change, none of the RX units can tell the difference between the two when firing. So unless there's a future firmware update that allows the lock out _all_ of the buttons on a TX V6, I guess I'm set with what I have been able to figure out so far. Thanks for the replies. composing) and a trigger with the other hand. No, the V6 straped to the neck you don't need to hold it in your hand all the time! I was holding it only to demonstrate that you would adjust power on that particular unit. Once you have the power set, just leave it on the neck strap and focus on shooting - with both hands on the camera. It's only when you have to adjust the power, you would let go of your camera attached on your Op-tech strap for a few seconds, pick up the V6, make the adjustments and then off you shoot again. I hope this makes more sense now? BTW, good to hear the V6 is giving you consistent flash firing! Ooooh, ok! I get it now, sorry, I thought the lanyard was for shooting. You're just saying to use it only for configuration. Very interesting, yes, that does open the possibility back up, and would prevent misconfiguration. So, my only concern is, if I turn on groups A, B, and C on the V6 TX, but turn off group D, will the V5 fire D anyway? If the V5 will fire D anyway, then unfortunately, it doesn't help me. But if D will ignore the fire signal because the V6 TX told it not to, then I will start looking for a couple V5's. Yes, V6 on lanyard just for controls. V5 on camera does the actual triggering. Despite the V5 essentially fires all groups, when you turn group D off from the V6 TX lanyard, it won't trigger from the V5 on camera. I just tested this to confirm. I'll look into picking up a couple of V5's! Hey Chris, thanks for your patience too. One update I have is that, yes, Phottix camera interface cables do work with Cactus V6's via a 3.5mm to 2.5mm adapter. Including the half-press to wake up the camera and focus. I'll keep you posted on the V5's. Thanks for letting us know @kalisiak. Ok, so, I have an update. I picked up a V5 Duo a few weeks ago, but it was at the end of the roller derby season, so I didn't have a need to test them out until last week. I was shooting a wedding this past Sunday, and brought all of my V6's and the two V5's. I mounted one V5 on my D600 and the other on my D3s, and then mounted my SB-600 on one, and my SB-700 on the other. Well, that didn't work out at all. The displays on the mounted flashes didn't show anything useful. Fast forward a bit, and I see the V5 has a cold shoe, which doesn't help me at all when I need to use one CLS flash on each of my two bodies, and have the remote V6's fire also. Is there a suggestion for when you need to mount a TTL flash on the V5 and have the TTL operate? Seems like you set it up differently? I thought you want off-camera flash, but you are now mounting your Nikon speedlights directly on the V5 that's on-camera? The V5 does not have a "cold shoe" because it has a centre contact pin for flash triggering. If you do mount your speedlights on it it will simply trigger them to fire. If you mount a TTL flash on a V5 you need to set it to M mode. In other words you can only mount a TTL flash on a V6 and set to TTL mode in order for the V6 to communicate with it (control flash power outputs) from another V6 unit. Strap your third Cactus V6 (3/3) on a neck strap, set it to TX mode as your main remote controller (flash power outputs of your SB-600 and SB-700). You mentioned Nikon's CLS - which is essentially an optical and not radio method of triggering. With the V6 you don't need to use CLS. shoe" as opposed to a "TTL hot shoe". Granted, it's not obvious, and you do have to look at the secondary body hanging at my side, but I do have an SB-700 mounted on it. So I guess I'm a little stuck at this point. I can either not use on-camera flashes at all, or I can try to hack something together for my D600 using a TTL shoe adapter with a PC socket, and a side bracket to hold the V5. For roller derby, I'd consider putting the V6 on the D600 and a V5 on the D3s, so there's still only the one V6 in use, but it's so easy to bump the V6 at my side that it'll end up being misconfigured anyway. Derby season doesn't start for another few months, so I have time to hack something together. That may be a good alternative, V6 on one body and V5 on another. You may also set the DIAL LOCK again, and this time go to the sub-menu and DISABLE the Temp Unlock feature. By doing so, you will need to long-press the OK button to turn off and on again manually. This can avoid any accidental bump or roll of the dial. A V6 should be able to pass i-TTL through (just configure the correct flash profile) and it can trigger a V5 through a cable connected to the sync-port. You could set the on-camera V6's channel to a different value and thus prevent it from interfering with the setup. You may still have issues with the V6's buttons being pressed inadvertently, but since you are using it as a pass-through device only, you may be able to protect its buttons somehow. Alternatively, an i-TTL cord or just the hot-shoe component of such a cord often comes with a connector on the side that should allow you to fire the V5. fire the V5." is exactly what I'm looking for, I'm not sure what Nikon offers that will give me that functionality.